San Leo raises on a rock 538 meters high enclosing in a little space a concentration of monuments and works of art as very rarely is possible to see in Italy. The site resulted to accommodate fortifications at the time of Umbrians and passed before under the dominion of the Senonian Galliums and later under Romans. In that time it was known as Montefeltro for the presence of a temple dedicated to Giove Feretrio, from which it derives Mons feretri. At the end of the II century a.D. arrived here Saint Leon in order to preach the Christianity. His presence was so determining that Montefeltro changed name in San Leo around year 1000. For its defensive purposes it was theatre of crash between Goths and Byzantins (VI cent.) before and Longobards and Franks (VII cent.) later. 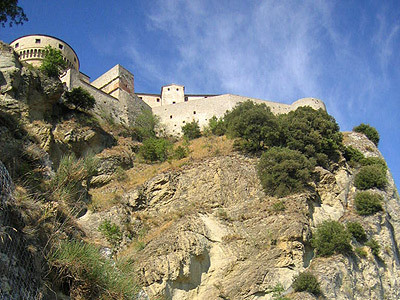 Passed under the dominion of the Church of Rome, Montefeltro then was managed by the count Antonio di Carpegna (faithful to Federico II of Svevia) of the branch of Montecopiolo then known as Montefeltro. The counts of Montefeltro will influence the politic of Central Italy in the '400 increasing their zone of influence to Rimini, Pesaro and Urbino (1234 with donation by Federico II). San Leo accommodated during the centuries personages of maximum relief like San Francesco d'Assisi, Dante Alighieri, Lorenzo de Medici, who besieged it for months and here wanted to erect a Palazzo Mediceo, center of the governor of the Florence's Republic in the village. Another personage who found dead here (1795) after a long internment and a papal excommunication was Cagliostro, the mysterious alchemist and massone who lived in the XVIII century. The monuments of San Leo are important and numerous and we list them here shortly: the Romanesque Cathedral of San Leo (1173) with the adjacent bell tower, the Pieve di Santa Maria of Assunta (XI cent.) keeping internally a ciborio (four columns with a voult above the main altar) dating back to 882, rose on the place where San Leo erected the first church, the Convent of S.Igne founded by Saint Francisco. Remarkable also the palaces in San Leo: Palazzo Mediceo (1417-1423), Palazzo della Rovere (XVII cent. ), Palazzo dei Conti Nardini on the main public square.